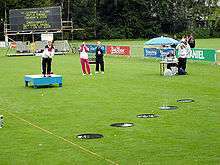 A competitor, Jana Maisel, casts her fly into one of the goal pools at the 2005 World Games in Duisburg. 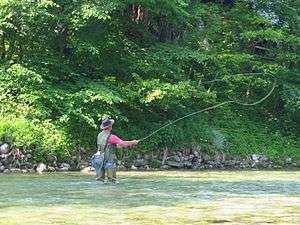 Casting (known as Casting Sport) is also a sport adjunct to fishing, much as shooting is to hunting. The sport is supervised by the International Casting Sport Federation (ICSF) which was founded in 1955 and as of April 2014 has member associations in 31 countries. The ICSF sponsors tournaments and recognizes world records for accuracy and distance. This sport uses plastic weights or hookless flies, and can be held on water or on athletic fields. There are competitive divisions for almost all types of fly, fixed spool and revolving spool tackle, and competitor classes. It is included in the World Games (see photo) and has been considered for the Olympics. The American Casting Association held its 100th Annual Casting Championships in 2008 at the Golden Gate Angling & Casting Club. ↑ C. Boyd Pfeiffer (1999). Fly Fishing Saltwater Basics: Saltwater Basics. Stackpole Books. ISBN 0-8117-2763-7. ↑ "How to cast further: the ultimate guide". Carp Fishing Hub. Retrieved 29 August 2014. ↑ "Members – Contacts List". International Casting Sport Federation. Retrieved 17 April 2014. ↑ "CASTING SPORT". International World Games Association. Retrieved 17 April 2014.